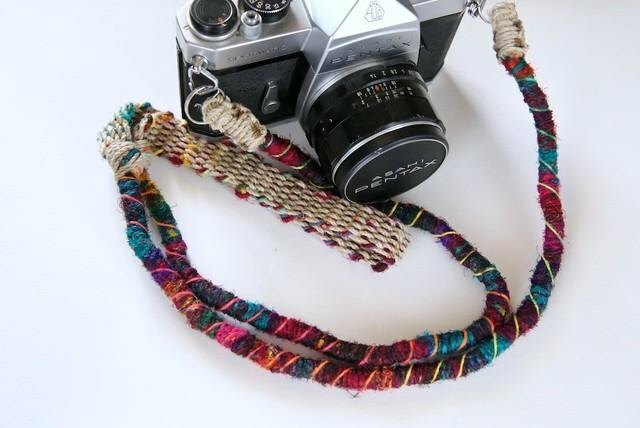 It is a hemp camera hemp camera strap wrapped in colorful silk thread and crazy color step dyed hemp. Since silk threads differ in color depending on parts and balls, only one strap can be made in the world. It is a hemp camera hemp camera strap wrapped in colorful silk thread and crazy color step dyed hemp. Since silk threads differ in color depending on parts and balls, only one strap can be made in the world. (So please understand that there are some differences in color taste with sample pictures) It can be used for cameras weighing up to 1,2 kg. The part which is applied to the neck has become a flat knitting of about 2, 2 cm in width so as not to get tired easily. The length is 120 cm of the length which can be taken diagonally. (Total length including fasteners) ◆ Length can be changed so please tell us if you wish <About fasteners> This is a double ring type. (Please note that there is no mistake in the fastener type) ◆ There are other "belt" type fasteners. https://jp.pinkoi.com/product/CQjye9KH It is also possible to change the fastener part to Nasukan (4332 yen) so we will send a message if you can. ◆ There is also a neck strap / hand strap hanging 1 point in the same series. About hemp (hemp) Hemp (hemp) is an environmentally friendly plant that does not require scientific fertilizers or agricultural chemicals because of the cannabis cannabis (oota). Our hemp is using the highest grade hemp from Romania. It is strong and long-lasting, it is a 100% natural material that adapts to your skin when you use it. Because it is less fluffy and soft, it did not scratch and stick to clothes even when it was on the neck. (There are individual differences in feeling) -------------------------------------------------------------- ◆ This item will be made after ordering. (About + 3 days after payment) ◆ 1 point 1 point Because of handmade, there are things that are somewhat different even in the same item and the stitches are irregular. Please kindly purchase after understanding in any way. **Purchase notes** ◆ This item will be made after ordering. (About + 3 days after payment) ◆ I will correspond as much as possible when I wish for delivery methods other than the description. ◆ 1 point 1 point Because of handmade, there are things that are somewhat different even in the same item and the stitches are irregular. Please kindly purchase after understanding in any way.